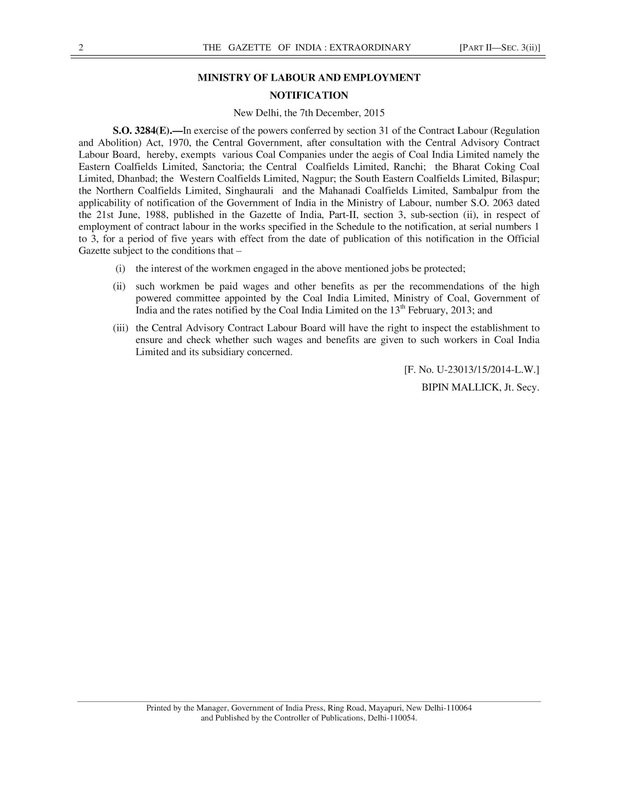 Section 31 of the “The Contract Labour (Regulation and Abolition) Act, 1970”, referred to as the Act, confers power to exempt in special case. 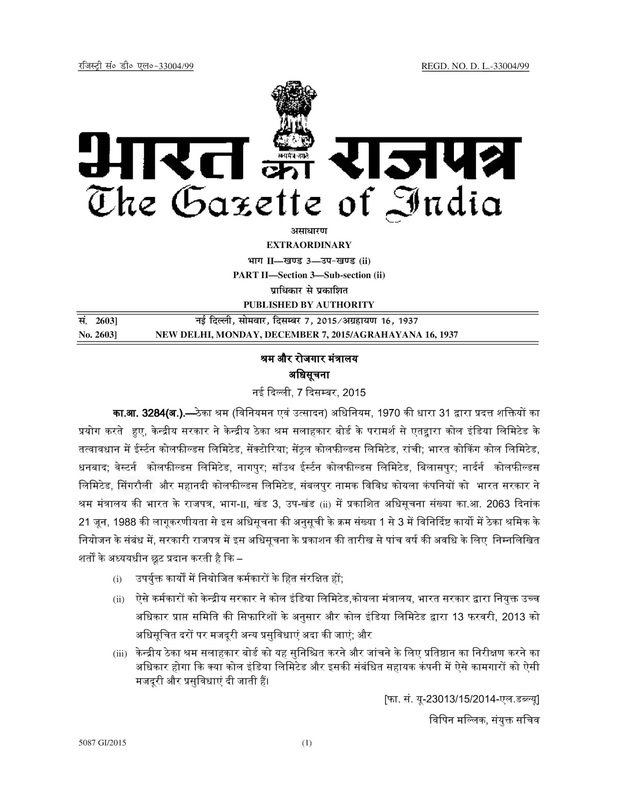 The section mentions that “the appropriate Government may, in the case of an emergency, direct, by notification in the official Gazette, that subject to such conditions and restrictions, if any, and for such period or periods, as may be specified in the notification, all or any of the provisions of the Act or the rules made thereunder shall not apply to any establishment or class of establishments or any class of contractors”. Andhra Pradesh is the only State Government in India that in 2003 amended this section by replacing the wording “in the case of an emergency” by “in public interest”. The Central Government has not carried out any such amendment in this section. Hence, except for the State Government of Andhra Pradesh, exemption can be granted under the Act, only when there is an emergency situation. (ii) Such workmen are paid wages and other benefits as per the recommendations of the high powered committee appointed by Coal India Limited, Ministry of Coal, Government of India and the rates notified by Coal India limited on 13th February, 2013. (iii) The Central Advisory Contract Labour Board will have the right to inspect the establishment to ensure and check whether such benefits are given to such workers in Coal India limited and its subsidiary concerned. Previous Exemption Granted Two Subsidiaries of Coal India Limited i.e. The Eastern Coalfield Limited, Sanctoria; and The Bharat Coking Coal Limited, Dhanbad; who were running in heavy losses and had become sick companies were referred to the “Board for Industrial and Financial Reconstruction (BIFR)” constituted under Section 4 of the “Sick Industrial Companies (Special Provision) Act, 1985”, were granted exemption from the application of the Act. The Eastern Coalfield Limited was granted exemption for three and a half years from 8th October, 2004 and The Bharat Coking Coal Limited for five years from 30th May, 2005. Sickness of these two companies can be construed as an emergency situation, wherein the appropriate Government granted exemption from the Act for specific period. This raises the question – Was there an emergency to exempt Coal India Limited from the Act? The decision of engaging contract labour is taken by the management of each establishment, and the permission for engagement is granted by the labour department of the appropriate Government. Contract Labour does generate employment, and large number of enterprises both in the manufacturing and service sector in India, presently engage substantial contract labour through a contractor under the provisions of the Act, by obtaining the requisite permission from the appropriate Government. At the same time, we need to recognize that the contract labour is by and large paid a wage much lower than the permanent or temporary labour of the enterprise. One can understand the reason of the Central Government in granting exemption from the Act to The Eastern Coalfield Limited, Sanctoria; and The Bharat Coking Coal Limited, Dhanbad; in 2004 and 2005, as they were sick units at that time. Reality is that hardly any company in India, even if it is a sick company, is able to convince the appropriate Government and obtain exemption from the Act for specific period. We had an emergency period in the country from June 1975 to March 1977, but presently there is no emergency in the country. Probably the Central Government perceived that there is an emergency with the operations of Coal India Limited and agreed to grant exemption from the Act to the company. The “Federation of Coal Industries Retired Employees Association” has also raised questions on the decision of the Central Government on granting exemption from the Act to Coal India Limited, and has alleged that this exemption is grossly against the interests of all the people (i.e. permanent employees, temporary employees and contract employees) working in the company. India sits on coal reserves of approximately 300 billion tonnes, and annually produces slightly more than 500 million tonnes. Coal India Limited, a Public Sector Unit is the major producer of coal, and the company plans to increase its output by 2019 to 1 billion tonnes per year. It is interesting to note that Coal India Limited, one of the seven Maha Ratna Companies amongst the Public Sector Units (PSUs) – the rest of the six are Bharat Heavy Electricals Limited, GAIL (India) Limited, Indian Oil Corporation Limited, NTPC Limited, Oil & Natural Gas Corporation Limited and Steel Authority of India Limited – in India, is granted five years exemption from the provisions of the Act, with effect from 7th December, 2015 by the Central Government of India. There is a need by all stake holders, including the trade unions, to question this decision of the Central Government, as to what was the emergency that led to taking this decision. Is this the new trend of “Labour Policy Reforms”, the Central Government is planning in the future? Or is it an approach to restrict the engagement of permanent labour in Coal India Limited, and help a Maha Ratna Company, belonging to Government of India to improve its existing high profitability; wherein even if the contract worker is doing same or similar kind of work as the workers employed by the principal employer, they be paid lower wage rate and lower welfare benefits, as the Act is now not applicable for the next five years. If this trend of granting exemption from the Act is to continue, then the balance six Maha Ratna Companies amongst the PSUs, who also engage contract labour and enjoy the same status as Coal India Limited, can approach the Central Government for being exempted from the provisions of the Act. Coal India Limited, apart from being a Maha Ratna Company, is a mining company, which has got an exemption from the Act for a period of five years with effect from 7th December, 2015. There is a large number of mining companies, especially in iron ore, lime stone and other minerals, both in the public and private sector, who would be interested in obtaining a similar exemption from the Act like Coal India Limited. Would the Central Government be prepared to grant the exemption, if they applied?